Shadow Bet Casino – 200 Free Spins with No Wagering and €1200 in Bonuses! Shadow Bet Casino has joined the list of recommended online casinos on our website, freshly launched in 2016 the casino offers an extremely attractive welcome bonus package for new players that includes a massive €1200 worth of casino bonuses along with 200 free spins! (20 Free Spins daily for 10 days in a row). Players from the UK have a slightly different welcome offer which is a 100% bonus up to £100 + 200 free spins on first deposit where the free spins have no wagering requirement. Shadow Bet Casino is licensed with both the UKGC (UK Gambling Commission) and the MGA (Malta Gaming Authority) meaning players from the UK are welcome to register along with many other countries, and you can rest assured you are playing at a safe, secure and fair site. The casino runs on the GiG (Gaming Innovation Group) platform with other big brands such as Guts, Rizk and Betspin and whilst not directly related to these online casinos you can generally be fairly confident that any casino running on this particular platform is going to be a slick and well-run operation. 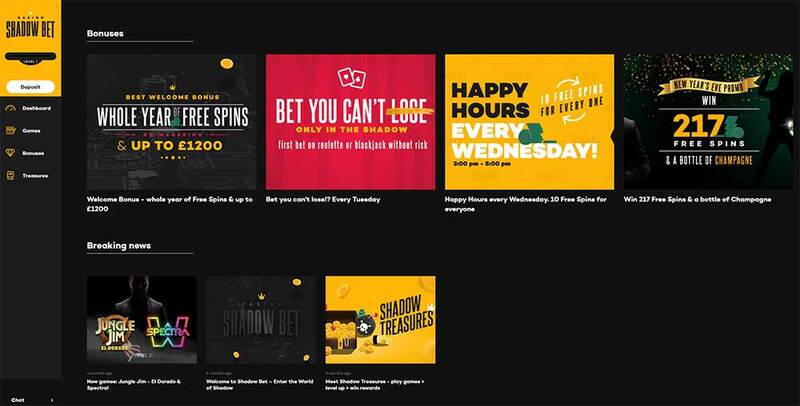 Using this gaming platform means that Shadow Bet already offers a massive selection of online slots to choose from with big slots developer brands such as NetEnt, Microgaming, Nextgen, Aristocrat, Quickspin, Play’N GO with plenty of smaller developers running on the NYX platform too such as Thunderkick, Big Time Gaming, and ELK Studios. Welcome Bonuses of €1200 and 200 Free Spins! New Welcome Bonuses Effective from the 14/04/17 – New Total Bonus Package €1200 + 200 Free Spins. Shadow Bet Casino – Whats does it offer to new players? Firstly, As soon as you have completed the simple registration process you are granted 1 free spin of the special Shadow Treasure Slot Machine from which you can win anywhere from 5 up to 50 Free Spins with no wagering required. Shadow Bet Casino then offers new players a massive welcome bonus package, €1200 in bonuses spread across 3 deposits along with 520 free spins with no wagering requirements which is definitely not be sniffed at, there is also a wealth of interesting and innovative features which will definitely appeal to online slot players. New players will find an extremely slick and well-designed online casino that works perfectly on desktop and mobile devices, an intuitive player account and rewards section along with a super quick search feature for locating your favourite online slots from the vast array of games already at this casino. Whilst they do offer a massive 520 free spins with no wagering spread out over 52 weeks (10 free spins per week), after the first initial 4 weeks has passed further deposits (min €10) are required in order to keep receiving them, but given these free spins are have no wagering requirements they still offer very decent value, coupled with the additional reload bonuses, level-up rewards, and current active casino promotions. Player Loyalty – Level Up and earn rewards! Built into the casino is a loyalty based progression system with some awesome and frequent rewards on offer, as you play any of your favourite slots or games you earn experience points and ranks. This is all easily tracked in your player account, as you rise up the ranks the rewards on offer increase in value too. 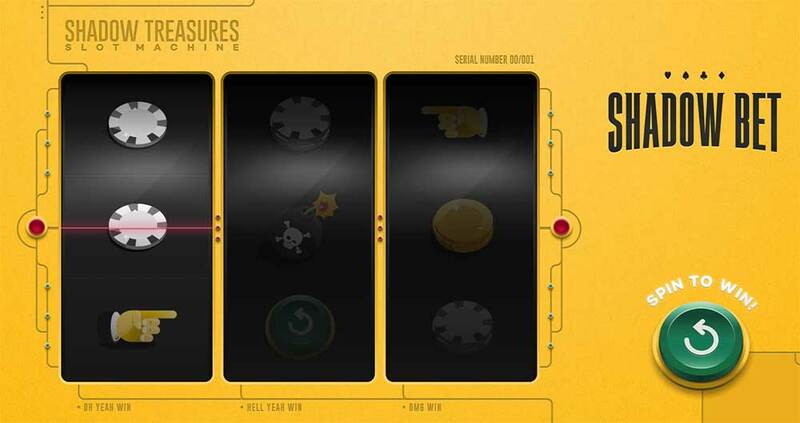 Once you have completed an experience level you are then given a spin of the special Shadow Treasure Slot Machine (shown below) from which you can win prizes such as free spins, cash, gadgets, and even holidays! The higher your total rank the bigger and better the prizes are on offer with 7 different ranks currently available at the casino, the highest level grants you Ninja status and frankly who doesn’t want to be a Ninja! 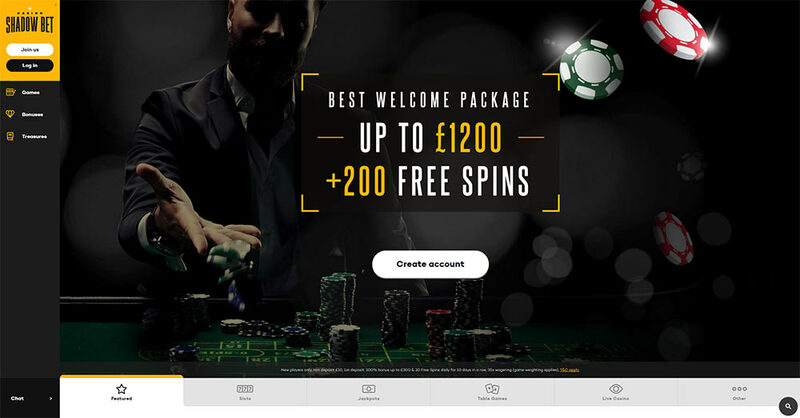 Shadow Bet Casino has a variety of Deposit and Withdrawal methods on offer at their casino these include Visa, Master Card, Paysafe Card, Neteller, Skrill, Trustly, Euteller, ecoPayz and withdrawals via bank transfer. Customer support is primarily from the live chat messenger feature which is accessible from the main left-hand menu, the casino offers live support on Mon-Sun from 8:30 am – 4:30 pm (BST). Shadow Bet Casino offer players a truly stunning casino experience, with one the slickest and easy to use casino interfaces around, coupled with the enticing welcome bonuses and huge range of online slots there are numerous great reasons to check them out. One feature we missed whilst playtesting the site was an easy way to track the bonus wagering left on the bonuses. The good news is that after speaking with the casino about this missing feature, it is already in development! Overall Shadow Bet is a very welcome addition to our site, and we believe they offer plenty of unique features that make it worth checking out yourself. Guts Casino are giving away €100,000 in the Spring Festival 2019!